Let TSP Design & Install a Patio for You! TSP Lawns & Landscapes - Grading - Patio Design & Installation, is a Lawn Care Services company serving the Yorktown ZIP 23692 area of Virginia. Our services include; Lawn Mowing, grading, landscape Design & installation, patio lighting & kitchens, spring/fall cleanup, irrigation systems, storm damage cleanup. The TSP service area includes; Yorktown, York County, Poqouson, Carroliton, Hampton, and Newport News. TSP Landscaping services include seasonal planting, leaf removal, irrigation systems, landscaping lighting, patios, redefining plant beds to installation and/or removal of shrubs and trees – possibly a complete makeover of specific areas or the entire yard. 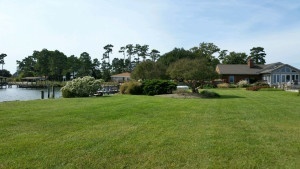 TSP Lawns & Landscaping, Inc. of Yorktown Virginia offers the typical mowing & trimming services. We help improve or maintain the health of your lawn through aeration, thatching, fertilization, topdressing, weed and pest control services. A custom patio or hardscape is a place where you can relax, entertain, and escape from it all without leaving the comforts of your own home. 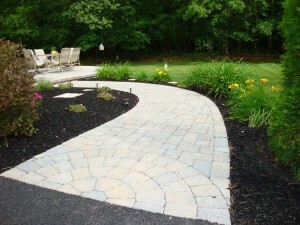 Let TSP design a custom patio for your home or business. Our design software gives you a visual look before we get started. TSP Landscaping – Grading – Hardscapes & Patio of Yorktown VA, will do the initial and final grading for new homes, as well as dealing with re-grading for drainage corrections. 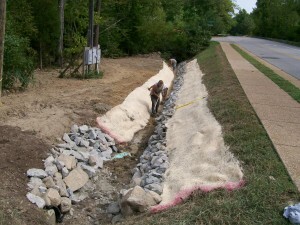 Stone drainage ditches can be installed for excess run off. Irrigation Systems by TSP offer the best in sprinkler system repair and installation in the Hampton Roads area of Virginia. 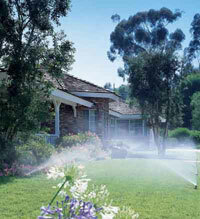 We also do additions to existing systems and modify, update your irrigation system, or flush the system for winter. TSP Lawns & Landscapes, Inc. is proud to announce Prestigious Turf Management the lawn care company serving the Yorktown area of Virginia. Prestigious offers three turf management programs which are defined by 5, 7, or 9 applications. 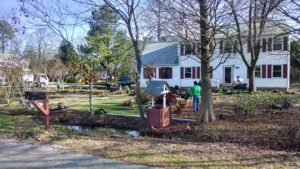 TSP Lawns & Landscaping of Yorktown VA, as part of our re-grading process will correct any drainage issues or as we call it drainage correction. TSP Landscaping of Yorktown VA specializes in leaf removal and fall cleanup. Our leaf removal equipment allows us to collect and remove leaves from beds and turf areas on your property effeciently and effectively. 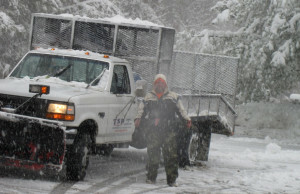 We offer experienced snow removal people and the proper equipment to clear driveways, parking lots, and commercial properties. Our operators can save a you from this difficult and strenuous task. 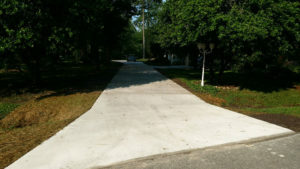 TSP Lawns & Landscaping of Yorktown Virginia is a concrete contractor specializing in concrete Driveways, tear out and replacement of residential concrete driveways. We also use custom pavers. In addition to the safety and protection offered by landscaping lighting the real plus is how it enhances your home and patio. There are many Benefits of professionally installed Outdoor landscape lighting. 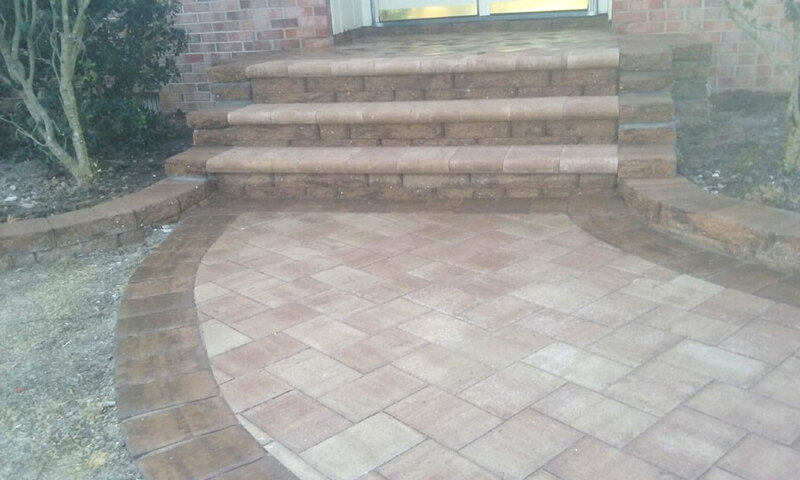 Along with patio design creates unique walkways for both residential and commercial clients. Our walkway use both pavers, stone, and pressed concrete. Each design is unique to your property. 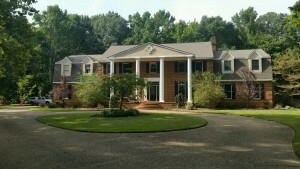 TSP Lawns & Landscaping - Grading - Patio is the best landscaping service in Hampton Roads. 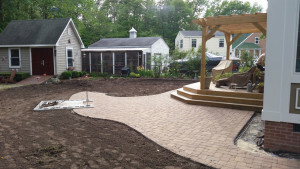 Our services include; affordable landscaping, grading, irrigation systems, fall clean up, snow removal, lawn care, concrete – paver driveways, patio design & installation, fire pits, outdoor kitchens and lighting. TSP servers the greater Hampton Roads area of Virginia including Williamsburg, Yorktown, Poqouson, Gloucester and Newport News Virginia.